Hooray! It is the end of week two of the four week "Wait No More Challenge!" 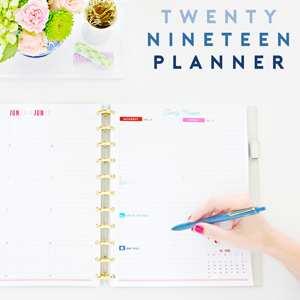 Are you still organizing full speed ahead? I am really loving the challenge and checking off some much needed projects from my list. We are not talking about dramatic room makeovers or major DIY improvements. These projects are the projects that are impacting our day to day lifestyles. The ones that slow us down, cause us frustrations and make us shake our heads in confusion. This week I tackled our vehicles and I went into the project thinking it would be a walk in the park. Boy was I in for a surprise! It would be a miracle if we could pull off a successful drive to the park with the condition of our vehicles. In my making excuses defense, it is nearly impossible to clean our vehicle for about 6 months out of the year due to our cold climate. Truthfully, I don't think either of our cars have been touched in over a year though, so I really don't think that my excuse holds that much weight. The funny thing is, I can't stand a dirty car because I just love the feeling of a fresh clean car so much more. But I had some major goggles on or something, because they both just got progressively worse and worse to the point where I didn't even realize how bad they really were. No joke guys, I went out this week to clean out the cars and had a minor panic attack in the middle of the day, in the middle of our driveway, in the middle of our neighborhood. I knew the cars were bad, but the back of the vehicle that we primarily use to travel as a family, was in far rougher shape than I realized or even could have imagined. Remember, this is a judge free zone friends. Toys, crumbs, dirt, coloring pages, books, water bottles, clothing, sporting equipment, more clothing... You would think we live out of these vehicles. Wait, we basically do lately! The front seat wasn't all that bad. Just felt dirty and had a lot of disorganization in the cubbies and crannies. I am sure cleaning out a car and organizing it isn't the most thrilling post to read, but my goodness, the outcome sure was thrilling to me. I completely underestimated the mess, and therefore, completely underestimated the amount of time it would take to clean out and organize both cars. Here are the steps I took to whip both vehicles back into beautiful shape. STEP 1: Assess (like really assess). Check out all areas of cars to determine scope of project and potential needs (this is where I failed to realize how bad things really were). I used my project planning printable to come up with a game plan. STEP 2: Create solutions for trouble spots. 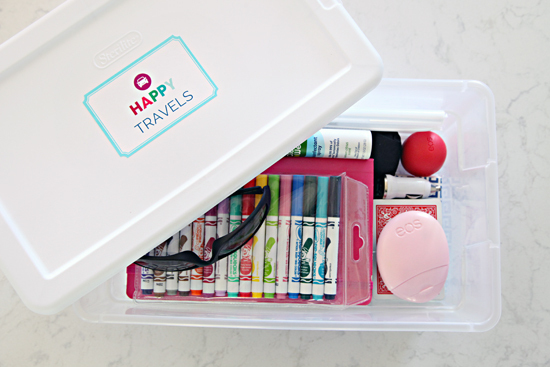 We were lacking in preparation and organization, so I put together a few kits to be better prepared while traveling. STEP 3: Sort and purge! Just like any organizational project, I got out some bins and started the sorting process. 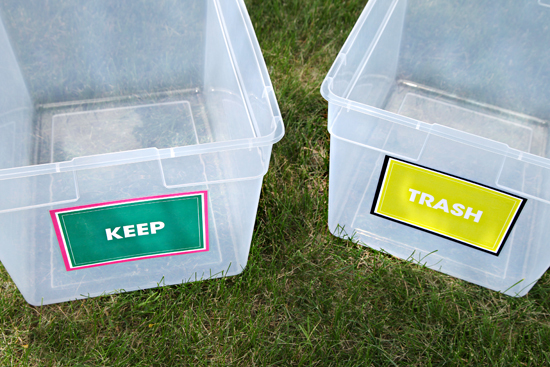 You can download your free sorting signs here. The goal was to empty the cars 100%. I enlisted the help of all of the boys, they were partly responsible for the mess after-all. STEP 4: Clean! Once we had the cars completely empty, it was time to scrub them top to bottom. 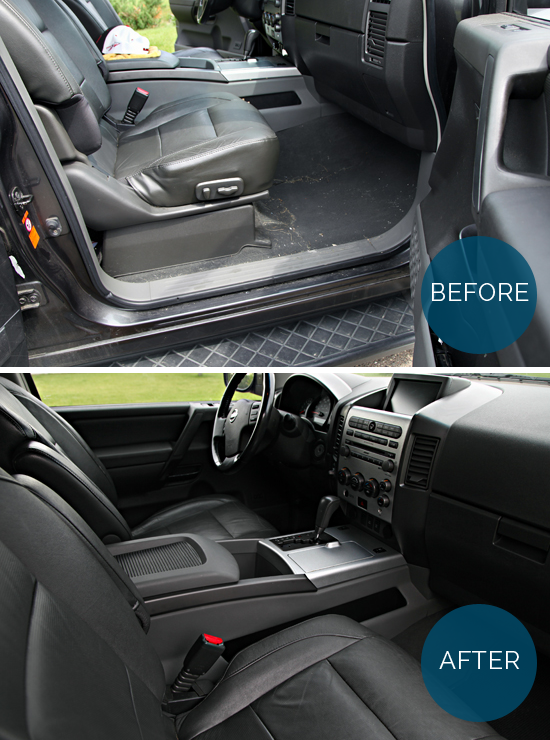 A small scrub brush paired with a bucket of warm water and dishsoap removed all of the salt stains from the floor mats. Once they were dry, I went back over them with our upright vac. STEP 5: Take it all in. Every last minute! STEP 6: Implement new systems. 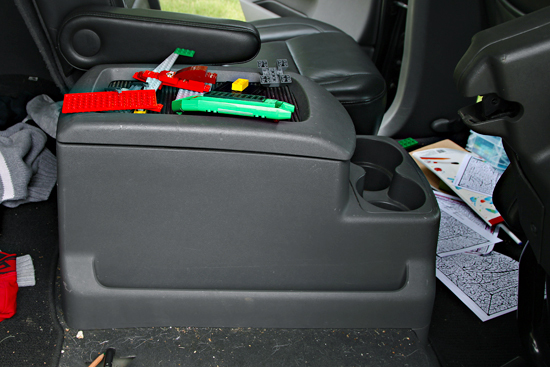 I had a chat with the kiddos, and we agreed that majority of the items we put in our car kit, should get them through shorter car rides without the need to bring a bunch of extra coloring pages or toys. We also agreed that part of the problem was not being diligent about bringing things in when we returned home. 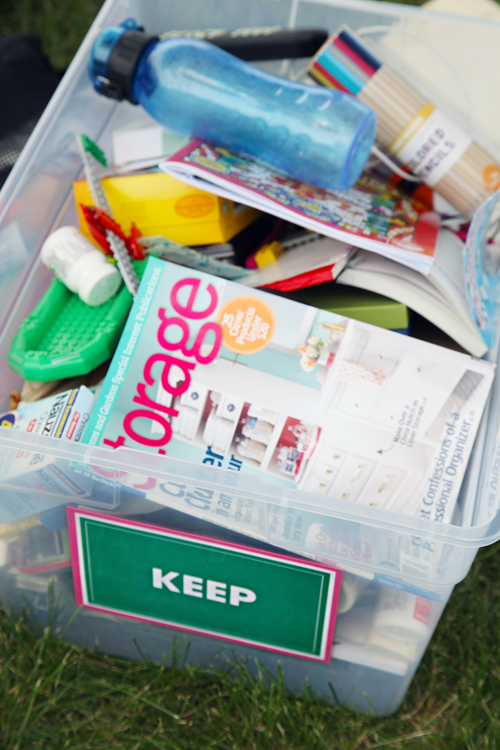 Our "keep" bin was full of items that needed to be brought back into the house and put away. I added a small trash bag to the back of the passenger seat in both cars. The sporting equipment was also put away, and replaced with a bin of essentials and our reusable shopping bags. I actually divided our reusable shopping bags into two sets of 5 bags each, keeping one set in each car. In the past, they were stored in the house and they were forgotten for far too many grocery shopping trips. 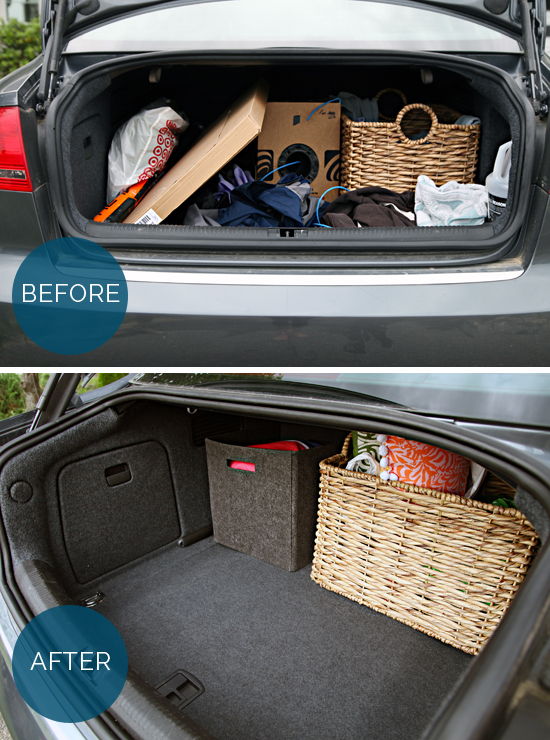 The woven basket in our car holds our returns, and can easily be moved from trunk to trunk. In the front of both cars, I made sure we had a plug and cord for each of our phones. 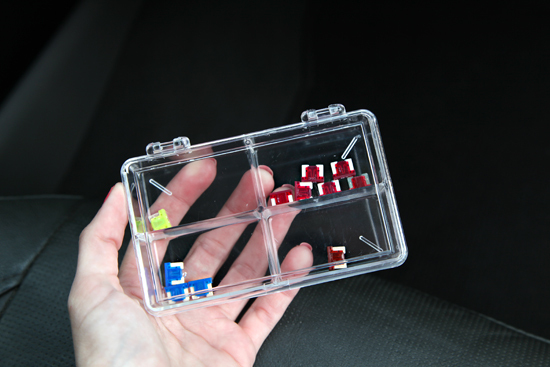 We keep spare fuses in both glove compartments. 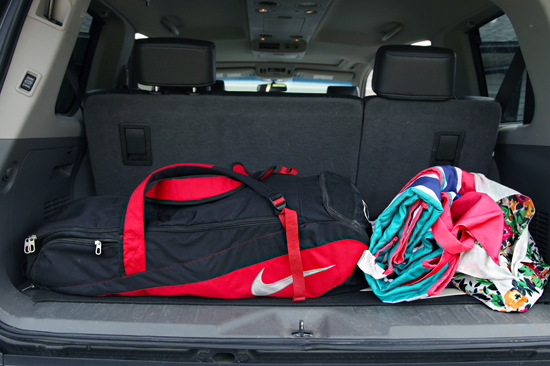 Our car had a nice divided case, so I mimicked it for the SUV. I also added a small container of money for tolls, parking meters or an emergency gas stop. I don't typically recommend leaving money in your vehicle, but I wanted to add a small back-up fund in both cars just in case. Does iced coffee count as an emergency? 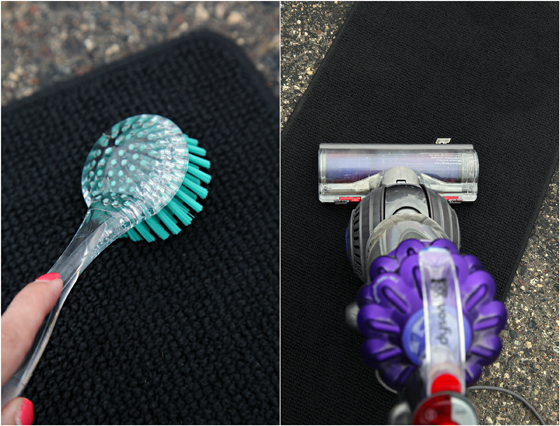 I didn't want to continuously purchase Swiffer refills, so I upgraded each vehicle to a reusable duster instead. 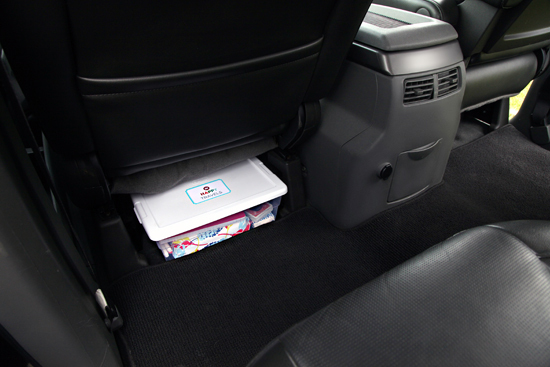 They are compact enough to fit in the glove compartments. We were also lacking in any type of document management in the car. 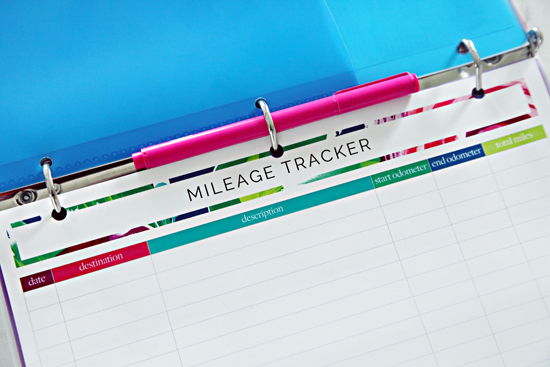 We didn't always have insurance cards in the car, and have been trying a few different methods for tracking mileage (we both need to track it for business purposes). 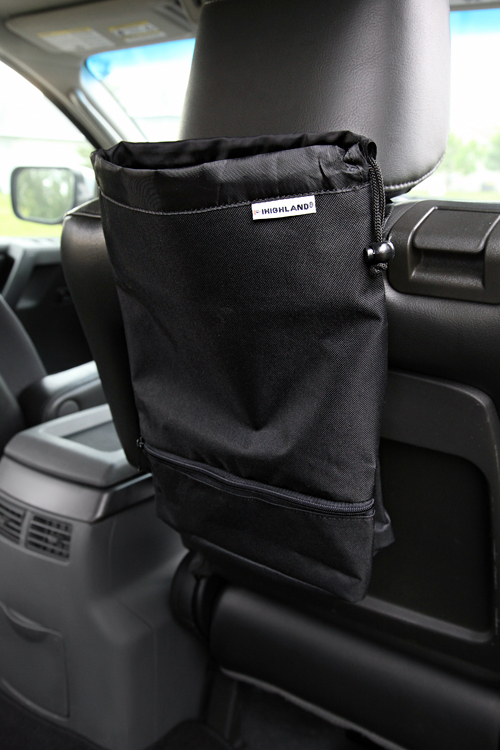 To solve the problem, I put together a thin Auto Binder to slide under each passenger seat. How about a quick look inside? 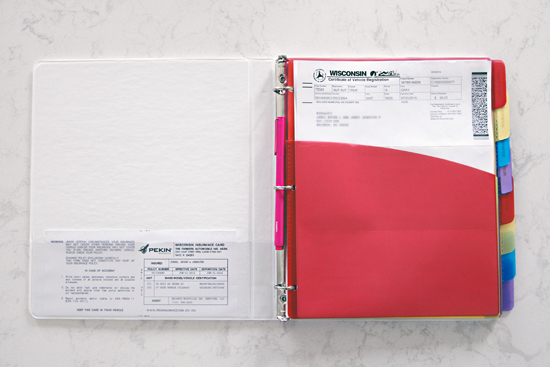 I used a generic white 1/2" three ring binder and dressed it up with some decorative paper and a label. 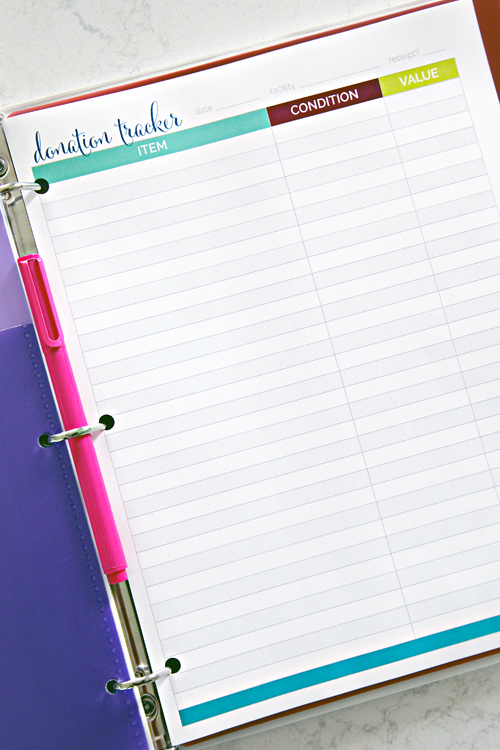 Inside, I used tabbed binder pockets, which are great for holding miscellaneous documents and receipts. 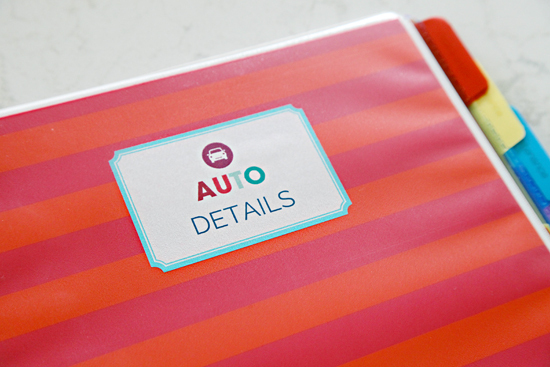 Right inside the cover, I added our insurance card and proof of vehicle registration. 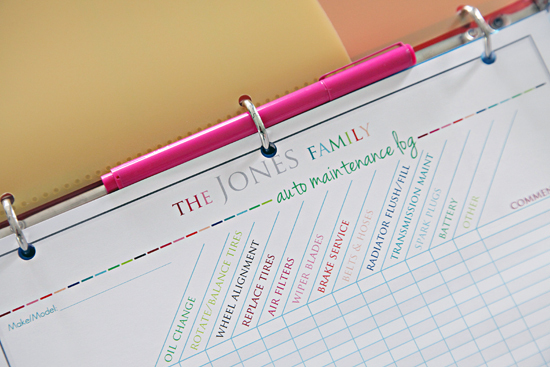 Behind another tab of more insurance docs/details, I printed out a new auto maintenance log, and filed away the previous one which we had been keeping in our Household Binder. The pocket is great for holding maintenance statements and receipts. 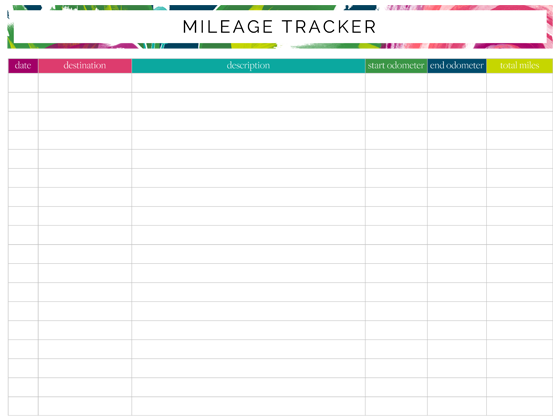 Next tab is a Mileage tracker, which I created for this project. Would you like one too? OK! For the final tab, I decided to take my own advice and keep a donation tracker in each car. We are always dropping off a small box of items at local donation facilities, and I find myself jotting down notes at the last minute in my phone or on random scraps of paper. Now, I have a much more organized way of keeping those details straight. The one shown above is from my shop here, but you can also download another version for free here. 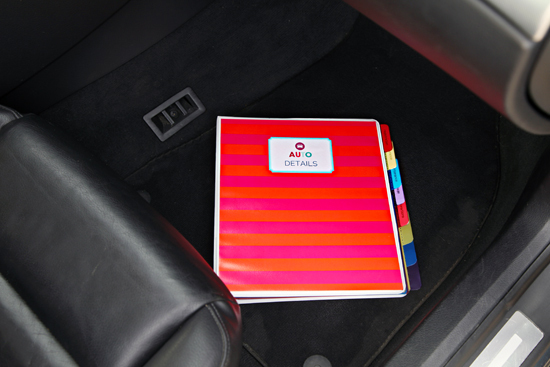 A pen fit perfectly inside each binder, and the cover provides a hard surface to write down all details while on the go. And that is that my friends! 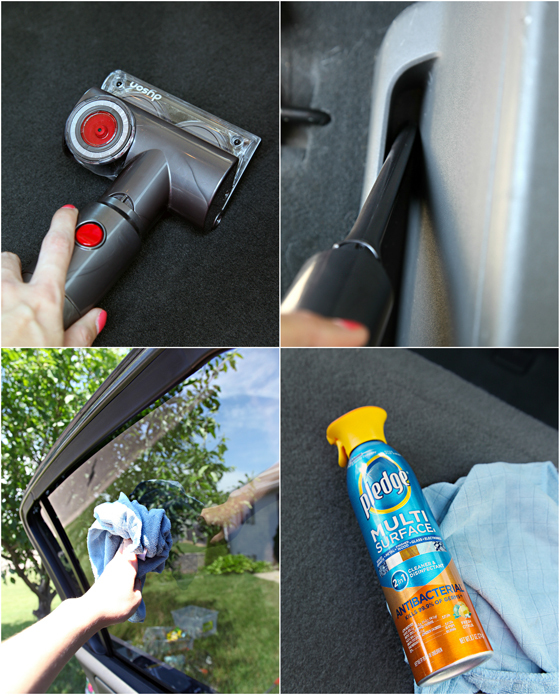 Our cars are no longer embarrassing or gross or dirty! Although I may be hiding under a rock in shame, I am doing so with a smile! Now! 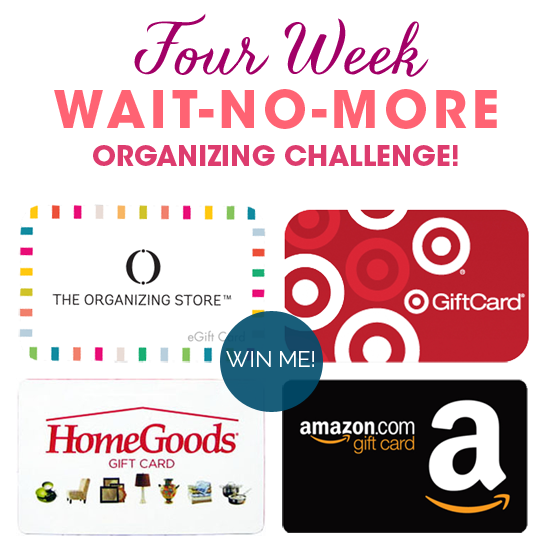 Who wants to win a $50 Gift Certificate to Amazon.com!? The majority of the items I used for this week's task, were purchased from Amazon (flashlights, umbrellas, tire repair kits, roadside flashers, fire extinguishers, collapsible pet bowls (thanks for the recommendations), dusters, trash sacks, etc...). 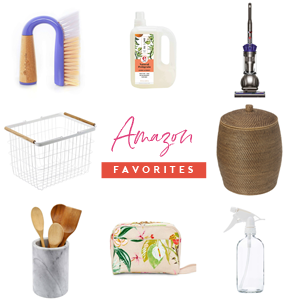 These days, I do the majority of my shopping on Amazon because it is convenient and typically less expensive than driving to surrounding bigger cities to shop. You can find just about anything for just about any project. Using random.org, one link party participant will be selected to win the gift card at the end of this week's challenge (no need to participate each week to win)! Time to share your Week 2 stories and projects with me! I was so overjoyed to see how many of you joined in with me last week! Let's keep the organizing momentum going this week! UPDATE! Congratulations to this week's winner! 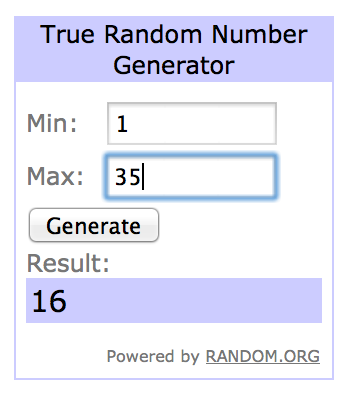 #16 has been selected by Random.org as the winning participant of Week Two! Keep an eye on your email, I will be contacting soon to coordinate your Amazon.com gift card winnings! 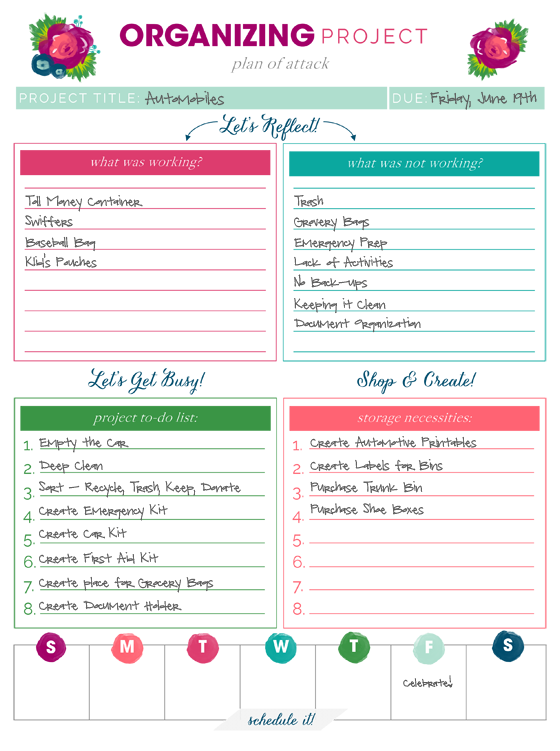 You can find all of the challenge details in this post here, and also download some FREE project planning printables to help you get started! Thank you for giving me a little organization motivation! Just linked up some EMBARRASSING before pictures of my fridge! Luckily, it all turns out okay in the end... clean and organized. Your cars look fantastic! I'm inspired to get after mine now too! Happy organizing! This post came at the perfect time! Last week, my car became the biggest, grossest mess it had EVER been! Fast food bags, cups, shoes, clothes, toys, even chewed gum (unbeknownst to me, my youngest had been using her interior door handle as a used gum holder...in sweltering southern summer heat...you can imagine the sticky mess!) covered every surface. I finally, with a little inspiration from your blog, cleaned out all the trash and toys. Now I just need to vacuum, dust, and wash the exterior. Thanks so much for the inspiration! This motivates me to clean my own car! My "emergency kit" is so stuffed with who knows what that I have forgotten what is in it. And I don't even want to think about the carpet nooks - but they are going to be cleaned today. Thanks Jen. Wow! That looks great! Now I just need to do the same for my car! Thanks for the tips and inspiration! Well, count me in the 10% who are gaga over the results...we did the EXACT SAME THING yesterday....3 hours worth of cleaning, purging and trying to identify a mystery brown, gooey liquid in the back storage area (no kids or pets to blame!! ).....decided it was a leaky mulch bag....our SUV is now a picture of perfection! Funny too, I also put a cloth storage square in the back...great minds...or at least 'desperate for order 'minds, think alike! We literally stood back and looked at our baby in awe..... and decided we can't drive anywhere today because of the puddles! LOL Love your binder idea....hhmmm...off to create one for myself! 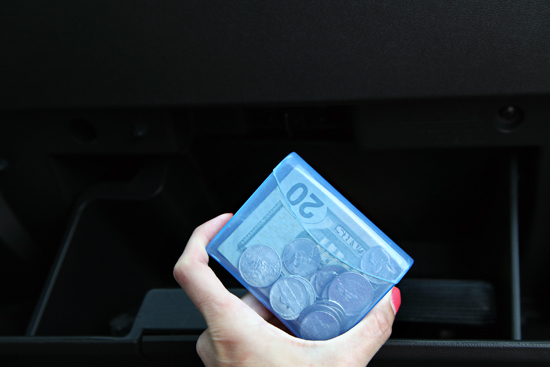 I read that the round gum containers are perfect to recycle for change in the car. Oh my goodness does my car desperately need the same treatment. I've been using the excuse that it's too hot (in the 100s last week) to clean it, but I think you just inspired me to get up earlier in the cool morning to get it done! Love it! I cant stand a messy car, but as our other car is brand new and mine is 16 years old, it is the designated the "crap car". It houses things for donation, an insane amount of things for my small business and currently the scent of a dog that found something dead to roll in. I needed this motivation badly!! Ive loaded an online cart with organizational goodness and am on my way to glory!!!! Hello Nora! The money holders are Q-tips travel packs that you can get at Target, Walmart, or Walgreens for $1.00 in the travel size sections. I also found them here: http://www.amazon.com/Q-Tips-Cotton-Swabs-Purse-Pack/dp/B0011FJPAY...hope this helps! You are welcome! Glad to help! I will never forget this great tip of yours. I personally use them for a variety of things. Love everything you've done! I did have one concern however... in some areas, if you get pulled over and go to reach under a seat to grab your insurance info, that can make a cop reeeeeeally nervous. And that may put you in danger. Just a thought. I love the addition of the duster. I cant tell you how many times I was waiting in the car at the gas station and thought of how dusty the dash is. Also, after we just had the original Chysler stock battery go dead in our 2008 car (who knew it would last that long?) I put a reoccuring yearly reminder in my phone to "winterize" the cars...test the battery and check the terminals for corrosion, put the snow brush in the car as well as jumper cables and any other seasonal things we dont keep in the car the rest of the year. That way I have a reminder/checklist so important things dont get left out. Love that tip! We have to do the same things each winter, such a great idea to set up a reoccurring reminder. 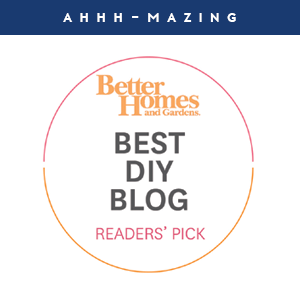 oh, and Congrats Jen on the BHG blogger awards! Opened this month's issue and saw you listed and said "that's my girl!" 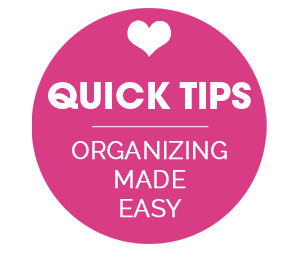 I know I have commented this before and said this, but its worth saying again...you have really, truly changed my life in the way of organizing by making it fun and managable and showing readers you dont always have to have everything organized because a small win is still a win! Thank you so much Nicole, your comment truly made my day! <3 And I love your summary, because yes, a small win is definitely still a win! So much more clean and organized! I love it! What kind of car do you have. 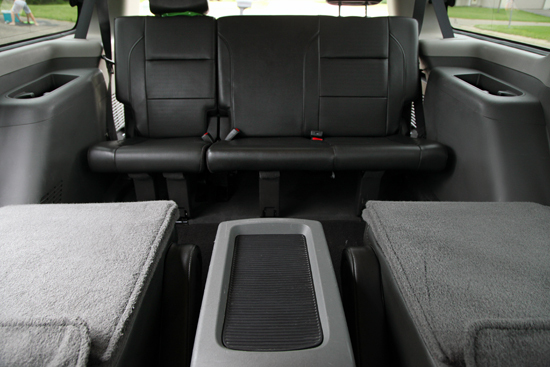 I like the console in between the back seats and the fact that they flip forward for easy access to the 3rd row. I have been toying with getting rid of my minivan but hesitate because it seems like a lot of cars that offer a 3rd row are hard to access. Your car has given me new hope!! I love this post, thank you! It's made me feel alternately better about the truly terrible state of my own toddler-carrier-come-work-vehicle, and desperate to do something about said state! 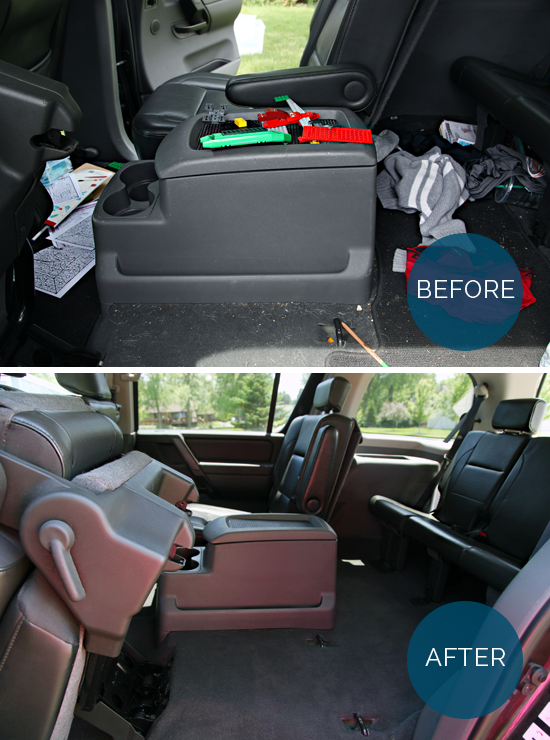 Let's hope the toddler is as good at cleaning out the car as your kids were (though somehow I doubt it!). 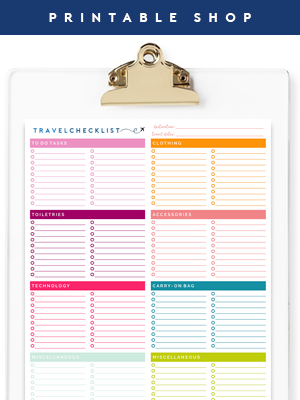 And thanks also for the mileage printout - I don't need the whole binder but I'm always forgetting to keep track of mileage and have to use a process of elimination and guesswork later! May I please make a suggestion about your auto binder? Do not keep anything that has your name/address on it inside the car (insurance card, proof of registration.) If your car is ever broken into, the thieves not only have your car - they know where you live and your name. Easy enough to make credit cards and steal your identity with that information. Also, it can set yourself up to have your house broken into. This was a lesson taught in our local police citizen academy classes. Your cars look great, mine are overdue for a cleaning also. I know what it's like to have those long winters and then I live in a condo so I have no place to wash and clean the car out. Thank goodness for friends that let me use their driveways and electrical outlets! Hi Joan! That is definitely something to consider. I know some states (ours is one), it is the law to keep your proof of insurance and registration in your vehicle at all times. xoxo! Hi Amanda! I just re-listed more in the shop. Thank you so much! 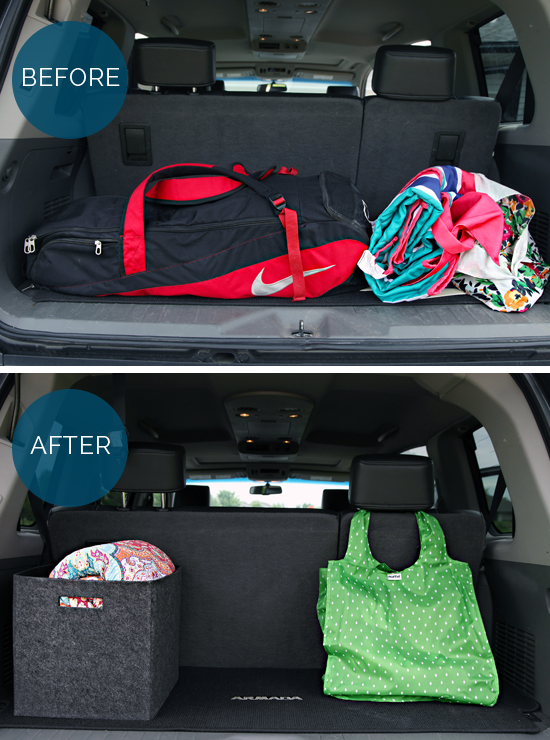 We live in WI too and my car, after club vb trips and a 4 yr old was a nightmare. I made a stop at the laundromat. $5 later my rubber car mats that were previously caked with gummy products, sand, road salt, and many more indistinguishable items looked brand new. 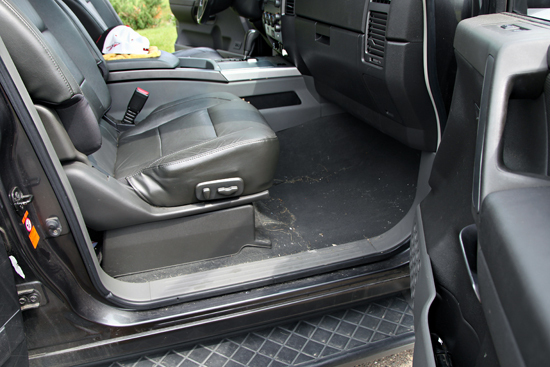 Even had time to vacuum the carpet and seats and make sure the air was right in the tires while the mats were cleaning! Sounds like $5 well spent! Putting your insurance card inside the binder's plastic pocket means the ink will come off and stick to the plastic pocket. Put the insurance card and all other cards in a small zip bag first. It will prevent the ink from lifting off. I wanted to let you know that I tried following your links to your etsy store and they appeared to be sold out. Upon further searching, I can't find your store on etsy at all! Hi Colleen! I just re-listed more in the shop. Thank you so much! I love your blog and have been following for awhile! 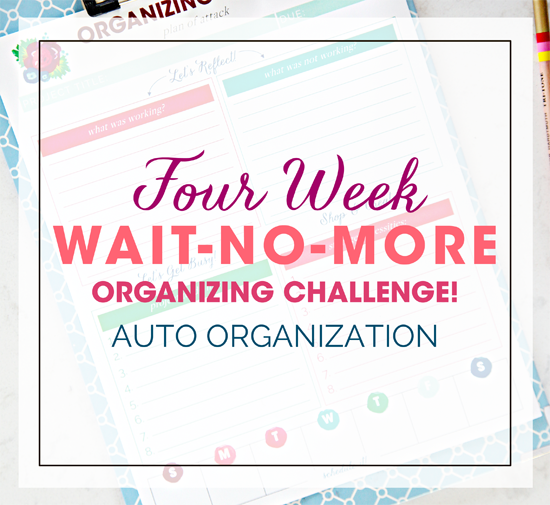 I'll definitely try to link up to one of your four week organizing challenge. Thanks for getting me started and I will definitely now tackle my car (which is in total bad shape) after seeing what great results you did! Thanks for sharing all your great ideas and freebies! Love it all! You've inspired me to start my own blog to document things I do in my own house and classroom. Beautiful and inspiring work, like always! Hi Jen! I absolutely love your blog. I'm so sad I can't participate in this month's challenge. I will try to get the next one! Your car looks great! 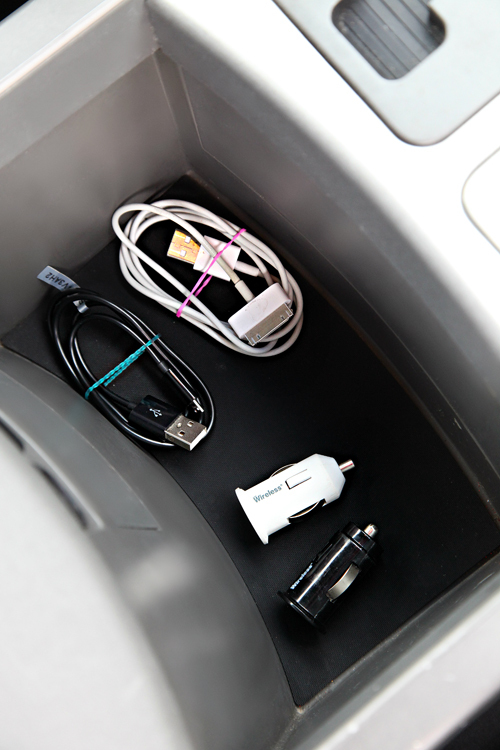 One thing I would like to mention is finding a better way to secure things in your car. If you are in an accident those loose items become projectiles. There are many examples of injuries caused by seemingly minor loose objects in vehicles if you want to research it. Your car is safer already! An alternative to recording mileage each trip is to have a "standard mileage" between home and places you routinely go to for business such as the bank, suppliers and in my husband's case, customers. Might be a project for one of your boys. I used map quest. is there a printable for the binder cover? Hi Nicole! The cover was some decorative scrapbook paper paired with a label I created out of Avery stickers. xoxo! Thank you Jen again for sharing with us your awesome tips! I am motivated to update our car kit too. I was wondering if you also add an extra change of clothes for your boys? I have two kids (ages 5 and 7) that are not babies anymore so I don't carry a diaper bag, but I like to be prepared. Do you suggest including them in the car kit or make a separate bin for each child? Your input is totally appreciated! The car mileage tracker can't come at a more perfect time!! Thank you! Thank you! Love your attention to detail!! 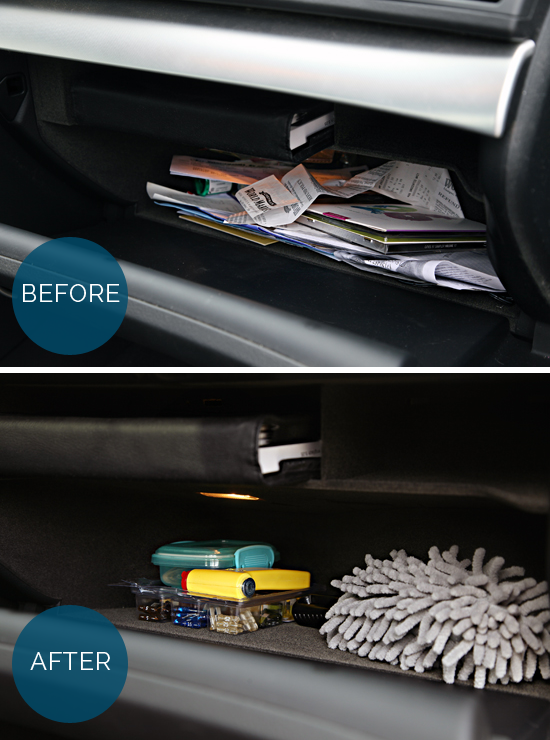 If your insurance cards are under the seat don't forget to WAIT until asked to retrieve them if/when pulled over. It's important to first keep your hands on the steering wheel before "reaching" for anything in the even you are facing a traffic stop.